Campaigners expressed their ‘immense frustration’ with the consensus process after Syria, the Islamic Republic of Iran, and the Democratic People’s Republic of North Korea blocked agreement today of the Arms Trade Treaty. Despite a courageous last minute attempt by Mexico, Japan and several countries to save the process, the President of the Conference reached a conclusion that consensus could not be achieved. The Control Arms Coalition says the historic treaty is still within reach but that the consensus process had delayed proceedings again today when a handful of sceptical states used their veto power against the huge majority of states, who want to see the treaty pass. Kenya read a statement on behalf of 12 states, calling for the UN General Assembly to adopt the Treaty by vote as soon as possible. The earliest this can happen is 2 April, next Tuesday, when the President of the Conference, Ambassador Peter Woolcott, will be presenting his report. It is widely anticipated the treaty would then pass by majority enshrining in international law for the first time ever a set of rules to regulate the global arms trade. Anna Macdonald, Oxfam’s Head of Arms Control, said: “The world has been held hostage by three states. We have known all along that the consensus process was deeply flawed and today we see it is actually dysfunctional. Countries such as Iran, Syria and DPRK should not be allowed to dictate to the rest of the world how the sale of weapons should be regulated. The Control Arms Coalition has broadly welcomed the new draft text though they have criticised areas where there are still gaps in crucial areas. The campaigners are concerned the list of weapons to be covered under the draft text is still too narrow and the criteria by which governments will assess whether to authorize an arms transfer is ambiguous. The coalition is calling on states to see the treaty as a starting point, which sets new international standards. Once passed, they want to see states aim high in their implementation plans and to sign and ratify the treaty as soon as possible. Control Arms Campaign Manager Allison Pytlak said: “Of course we are disappointed. Lives are lost each day because there is currently such poor regulation of the arms trade. Baffour Amoa, President of the West African Action Network on Small Arms, said: “This is a strong disappointment for Africa. An Arms Trade Treaty is long overdue. Too much blood has been spilt in Africa through armed violence that could have been avoided. 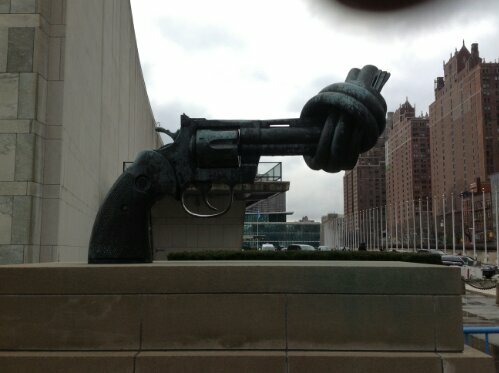 Control Arms has published their reaction to the final draft of the Arms Trade Treaty. Just before the negotiations ended earlier today the President of the committee stated “take it or leave it” and then an hour later the final draft was published. “We see some improvements have been made since the last draft was issued but there are still some important problems with the new text. “The scope of what would be covered in the treaty is still too narrow. We need a treaty that covers all conventional weapons, not just some of them. The criteria by which governments assess whether to authorize an arms transfer also need to be unambiguous. “There are 24 hours to go before the end of this conference. The 103 states who so clearly said on Monday they wanted a strong text must not give up. They must spend the remaining time we have ensuring we get a robust treaty agreed tomorrow. It has been nearly 10 days of tense negotiation at the UN in order to solidify a strong Arms Trade Treaty that will protect human lives across the world. Between legal scrubbing, lobbying, educating, connecting and making sure everyone’s needs are met there is still a large gap where the lives of millions of people remain at risk. World leaders and their delegations are getting down to the business of closing loopholes but there is still a dire need for stronger language in the area of diversions, ammunitions as well as gender based violence and child soldiers. 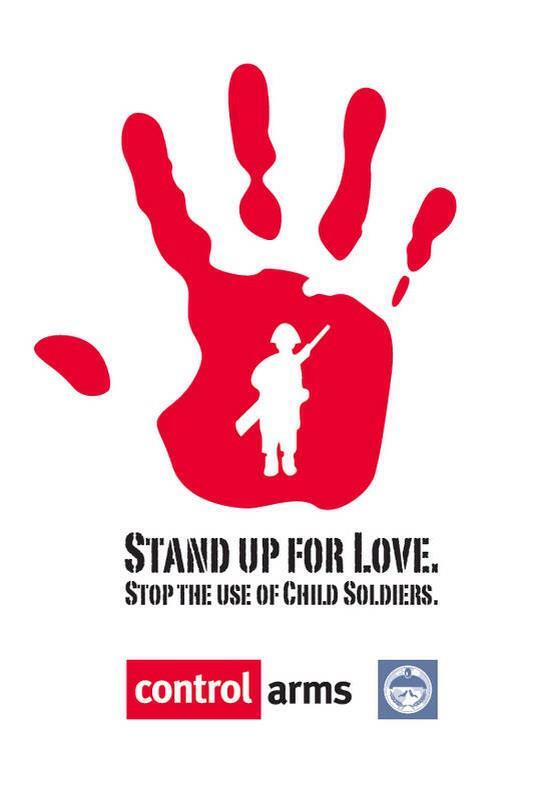 The last two issues have yet to make it into the treaty and if this treaty is granted without the issues of child soldiers or gender based violence being a part of it then the world will leave millions of the most vulnerable citizens prey to those who seek to do harm. Vision Gram International is committed to lobbying for these issues and has committed their mission as an organization to assisting and supporting those who have been victims of these two heinous crimes against humanity. Victor Amisi, founder and executive director of Vision Gram, and various other members of his team have attended to the process of the development of this treaty since it began in 2006. They are busy meeting with the delegation from the Democratic Republic of Congo, The International Coalition for the Responsibility to Protect as well as various other groups in order secure the language and needs of the unheard victims of illegal arms trade. With only 24 hours left in the treaty negotiations there has been some progress but also so many challenges remain. Many believe and Arms Trade Treaty will be reached but much speculation remains as to how strong the language will be. It is a historic time for the world and for the international community and a strong Arms Trade Treaty with language that seeks to stop the illegal trade of arms will better the world in remarkable ways. We ask that all delegates and groups push for stronger language on diversions, ammunitions, gender-based violence and child soldiers! 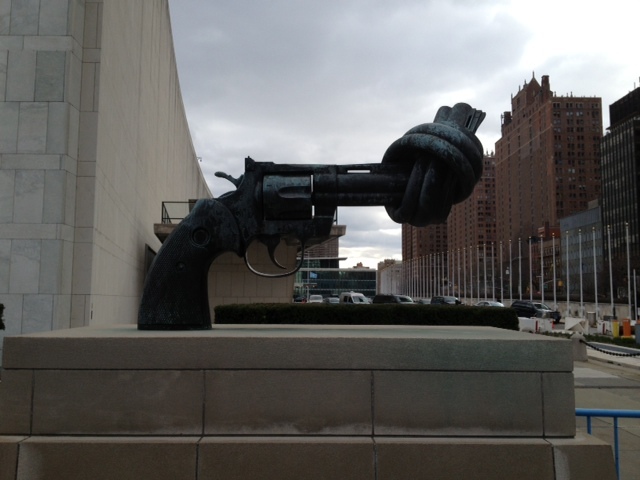 The world needs a strong Arms Trade Treaty…….FINISH THE JOB! Jonathan Frerichs, Programme Executive from the World Council of Churches, says: “Without bullets, the guns fall silent yet still the transfer of ammunition is not fully-covered in the text. Oh Canada. The land of snow, polite people and Tim Hortons.. Right? So often as Canadians we have the perception that in the view of the world we are small potatoes. Unimportant. Harmless. We see the images on our news programs and think it all has nothing to do with us. In some ways you would be right. On the international level, Canada doesnt matter much. Unlike our powerful neighbours to the south, we do not have any seat, much less a permanent one, at the UN Security Council. Though we are signatories to many UN treaties and declarations, we are not a prominent voice at the table. We certainly arent the smallest (population) nation at the table. Nor are we without economic interest in the outcomes. In fact Canada is currently one of the most invested countries in the mining interests in the Democratic Republic of Congo. Yeah, I bet that suprises you! Something else that might suprise you? 8 million people have died in DRC since 1996 and hundreds of thousands of children fight in the armed groups.This conflict is being fueled by minerals & the trade of minerals for weapons. And on this subject Canada is largely silent. Last July and for the past week, Canada has had the chance to speak; to address some of the issues destroying the DRC and many other blood-soaked nations around the world, in the arena of what is dubbed the Final Arms Trade Treaty Conference at the UN in New York. Instead it offered minimal comment in the negotiations and only with a few glib remarks.. Something about the recently abolished long gun resgistry.. Yeah. What? In the same week that the treaty conference convened, the Harper government cut CIDA in its Economic Action Plan (fancy name for a budget) affecting Canada’s contributions to development globally. Despite calls from Elizabeth May of the Green Party and from Foreign Affairs Critic MP Paul Dewar, the government remained silent on the Arms Treaty. In response to questions in the House last week, and from its last official statement from July 2012, Minister John Baird, regurgitation gun lobby mis-information, stated Canada was concerned about limits that may be imposed to civilian recreational arms users. As has been explained time and again to America’s NRA, this is baloney. The treaty as drafted does not in any way limit recreational users. Nor is it a logical statement, because Canada already has laws governing registration of firearms as well as many of the light weapons to which the treaty refers are not even legal in Canada. So the question remains: Does Canada support an Arms Trade Treaty limiting the global trade in illicit weapons, and if not, why? 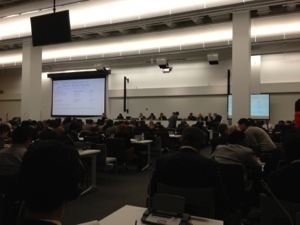 On day four of the Arms Trade Treaty Negotiations at the UN in New York City a draft of the Arms Trade Treaty was presented to all 148 nations present. But to each and every delegation there were complex words such as “of” and “in” that had to be changed and could only be announced through a speech. Whle the legal scrubbing of this document took hours a prominant theme emerged…the US and Canada do not want to include any form of ammunition in this treaty. Yes, ammunition. Both countries are willing to regualte arms but not ammunition. Each country that stood up to voice concerns about the legal jargon in the draft of the bill all also stated they wanted ammunition included. Each and every country. Many catch phrases began to surface on twitter and in pamphlets around the UN that read “there is a treaty to regulate arm chairs but not arms” or “even bananas are regulated by a treaty but not arms.” So why is it so hard to regulate illegal arms trade that is proven to kill thousands and thousands of lives per year yet we control bananas? Well, the short answer is that war is big business! Ammunition bring in millions of dollars every year to these super power coutries so why would they want to stop the use of their cash cow? Yet, the unregulated supply of ammunition creates a loop hole for rebel groups around the world to access these supplies without restriction. Rebel groups in Somalia and DRC as eveidence of the killings that go on unrestricted and with impunity. A comprehenisve Arms Trade Treaty will stop the gap of unrestricted access to ammuntion where arms ebargos have not. Yet, with both the US and Canada fighting this move it seems unlikely that such a measure will see the light of day in this bill. Powerful gun lobbiests presented their concerns at the end of day four but most activist and journalist in the room found this group quite entertaining and laughable. First of all, a comprehensive Arms Trade Treaty has absolutely no effect whatsoever on any US or Canadian citizen to own or operate a weapon. Those rigths are protected under the US Constition and no international Arms Trade Treaty can ever effect the US Constition. One woman even promoted a “fear tactic” method in order to get her point accross to the dignitares stating all women need to own guns because they will be attacked and raped. It was a head slapping moment for the majority of the room.